Engineers at Flann Microwave are celebrating the publication of a new three-part international standard that will define how waveguide is used for decades to come. The team at Flann played a key role in the development of the new Institute of Electrical and Electronic Engineers (IEEE) standard IEEE 1785, which sets requirements for waveguides from 75 GHz to 3.3 THz. Previously there was no internationally agreed standard for waveguides operating above 330 GHz. Dr James Watts, Chief Executive of Flann Microwave, said: "This work will be hugely important in the future as the sub-millimeter bands are increasingly used for communications, security imaging and remote sensing applications. Indeed the previous British Standard, International Electrotechnical Commission and US Mil Standards have remained largely unchanged for 40 years." With a 60-strong team based in Bodmin, Cornwall, UK, Flann Microwave has grown over six decades to become the market leader in the design and manufacture of precision waveguide components and testing and calibration equipment, serving customers in the telecoms, government, automotive, aerospace, defence and research sectors. Flann has also worked with UK and overseas government agencies to write many of the standards used in the industry. 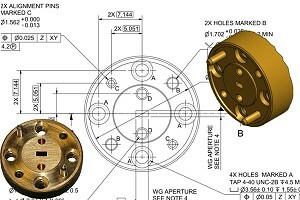 The Flann team has been working with the IEEE Standards working group since it was formed in March 2008, and the interface drawings in the new IEEE standard were produced by Flann mechanical engineers. For nearly sixty years, Flann Microwave Ltd has been a market-leading designer and manufacturer of Antennas, Precision Microwave Components and Test and Measurement products operating between frequencies of 2 to 500 GHz. The company was founded in Kingston Upon Thames, Surrey in 1956 by Bernard Fleming and relocated in 1970 to Bodmin in the South-West of England – an area renowned for its beautiful scenery and a popular place in which to work, live and holiday. The U.S. operation, Flann Microwave, Inc., was established in Boston in the 1980's to support the Company's sales activities in the USA.